My last autumn manicure. I can't believe tomorrow is December. I know I'm a broken record, but time is really flying.I really wanted to do this painting I saw on the Paint Nite site on my nails. I always get emails to go do a Paint Nite and I love to browse them because they are awesome nail art inspiration. This one is beautifully transitional as I move to winter manis and holiday collections tomorrow. Today is exciting because I have a new Polish Pickup from a brand I've never used before. Le Polish has been around for a while, and it's purely my fault that I haven't tried them before! What's even more awesome is that this polish is Chanukah-themed! There really aren't many Chanukah polishes out there. The few I did have were glitter top coats named Eight Crazy Nights. While I love Adam Sandler for repping the Jews with a song, eh. So I love the more inspirational name for this polish! Today, I have something totally new and I forced myself out of my comfort zone to try! I've been hearing about dip powders in the nail world for a while. As someone who changes her polish frequently, I wasn't really interested. But then I received this kit, and was still scared. But my cousin was telling me how she swears by these powders, and well, I had to sit down and give this a shot! I had to throw in a few more autumn looks before December hits! I actually wore this after I destroyed my harvest manicure cooking for Thanksgiving. I chipped it so badly, that I was picking at my nails!! Well, I was still visiting home, and had thrown in these two polishes in my bag, and I figured a quick gradient would work! What better way to welcome the week than with a beautiful, blingy, sparkly, explosive, gorgeous, an aka "you need this polish" polish?! It's no secret that I love Stella Chroma. Her polish wears like iron on me and the quality and presentation is top notch! This month's Polish Pickup is one you do not want to miss! Tis’ the season to sparkle and KBShimmer has you covered! This winter, enjoy 8 all new shades, each with holographic sparkle. As you put up the shining lights, wrap up gifts in jewel toned paper, or pour a glass of seasonal cheer, these bright and festive colors will bring home the feel of the holidays. The winter collection will feature KBShimmer’s new 5 free polish base and retail for $9.25 each. I didn't forget about Pusheen this month! I was really hoping for an adorable Pusheen turkey, but I think that was last year's calendar image. This November, we appreciate why we are thankful for our cats! Haha. It's time for me to start sharing some of December's Polish Pickup! Today, I'm sharing Alter Ego Not a Mother Day. This polish honors those who cannot have children, and it's wonderful for AE to think about a "holiday" that not all might think about. Have I been having fun with this collection or what? I've been so busy stamping acorns and painting woodland creatures, I finally sat down to get you straight swatches. What's even better is that today kickstarts Black Friday weekend, and there's loads of amazing sales on Girly Bits' site! Those deal will be at the bottom of this post. So sit back, write down your favorites, and head to the site to get some great deals! Hello there! I just wanted to share my current mani that I'll be wearing for Thanksgiving! I bought the Lina Autumn Plate for this exact image, and had been waiting to use it for this Thanksgiving break! 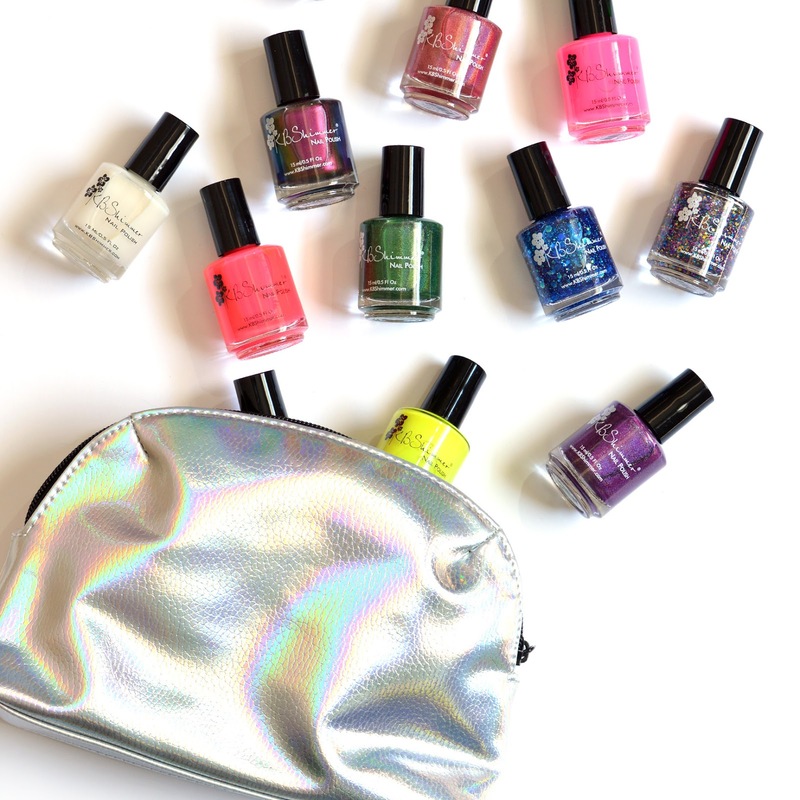 Today is a super special nail polish day! If you didn't know, I am an avid Gilmore Girls fan. I watched the series with my mom while it aired on WB! Every Tuesday night, we would sit down and enjoy the show together! I went to college the last 2 seasons and my mom recorded it on VHS (HOW OLD AM I?! lol) and we would binge the season over weekends that I came home. So many memories! So when I won a custom with Fair Maiden, I knew I wanted it Gilmore themed! And better yet, there's an EVERY EPISODE EVER marathon on UP channel right now, so I've been binging myself haha! When the parades are over, and you can’t stand to watch another football game, you know it is time to get your Black Friday on! So heat up those leftovers, boot up your computer and get ready to enjoy the 2017 KBShimmer Black Friday sale. Oh my!! Thanksgiving week?! Where is time going?! STOOOOP. So today I have a manicure I've envisioned for a while. Let's take two loose chameleon flakes and blob them together and stamp some leaves! YES. On Friday November 24th (Black Friday), Zoya is giving thanks to our fans by celebrating Black FRIYAY! Valid to US and Canada Consumers until 11:59pm ET on 11/24/17. (International Shipping Fees Apply for Canadian customers). Can you believe that Black Friday is this Friday?! I'm not one to actually go out in early morning shop, but I do check out the Cyber Monday deals sometimes. Well, today, I have a special polish that will be available Black Friday (11/24) to Cyber Monday (11/27). Eeeee I love my manicure today! I have another Target Dollar Spot-inspired manicure! I seriously love the Dollar Spot. I bought a Halloween and a Harvest sticker book. I don't know why, but I did! I saw those stickers and knew they needed to be a manicure! The new Girly Bits cremes fit the color profile AMAZINGLY, so let's discuss! Happy Monday! Today I have the newest collection from Big T Ranch which is the Winter collection, which I am calling the Vacation Chameleon Flakies set! Each flakie top coat is inspired by around the world. I just love the look of these. Look at these bottle shots. Each one has unique shifts. There's tons of photos, so I'll get right to it! OH hello Tuesday! The weather is getting brisk and Stella Chroma has new Late Fall collection coming out this Friday! Not only was this collection a collaboration with Mr. Stella Chroma, it speaks to Stella Chroma's home! So keep reading for the full inspo and how this connects to the charity she will be donating to! Good evening! Tonight I have a non-polish post, but honestly, Pusheen very much connects to my blog, LOL. Just put Pusheen in my search bar and see all the manicures that come up! Pusheen is a lifestyle, haha. I got the Pusheen Box sub box as a birthday gift from a bunch of lovely nail polish eladies, and I shared the Summer 2017 Box here. Here's the fall! Hope you enjoy the last day of the weekend. I'm quickly posting this as I'll be heading to some farms in a few hours for pumpkins, apple cider doughnuts, and fun. So it's appropriate that I have on this pretty orange! I actually took out all my fall and Halloween polishes, and I've got to say, I used about 90% of them! So I'm proud of that! Hi all! Sorry for the late post today, but it happens! I actually JUST took this mani off today and it was so cute! So many people stopped to look at my hand! I just love autumn and I love the images that are associated with the season. I knew I had to do this acorn image! I started with a base of Blush Lacquer Nerida Singer, which I bought last April at Polish Con. I needed three coats for opaqueness. Holy cow, I LOVE THIS COLOR!! Then I grabbed 3 of the new Girly Bits fall cremes, and went to town! I used the Lina Autumn 01 plate for the acorn image and stamped with Stump Up the Jam. I filled in the top of the acorns with Butternut Leave Me and filled in the bottom with Acornucopia. I'm so cheesy but it was the perfect fit! Then I matte it, and I loved it! These Girly Bits cremes are amazing! I'll be back with a lot more art and proper swatches later. I loved this look shiny also, but it was so shiny that it was difficult to photograph! The top coat is Girly Bits What A Rush, which dries super fast! You can find the entire Girly Bits creme set HERE. The ten piece collection retails for $118 USD (just under $12 each) or you can grab them individually (same price). I have many more manicures planned but I've been testing these as stampers and one coaters and they are both! Yesterday, I showed you the Girly Bits November duo and I realized that these crystals would go perfectly with them! SO let's check out these fun multichrome rhinestones. Happy Hump Day! What better way to say hello to the middle of the week than the Girly Bits November CotM!? And the great news is that this is still under early bird pricing until the 10th! So check out my swatches and go order up! We are trucking along with the week and today, I have a product you may have seen before. Or, maybe it's new to you. Either way, this is a fun little gadget. I mean, I have TONS of kitchen gadgets, so nail gadgets are up my alley! Hi All! I'm kicking off my week with a decadent scrub. Trust me, you want this and today is the last day you can grab this scrub, as it is an exclusive through The Polish Pickup. Like Breaker of Chains, this scrub is inspired by Game of Thrones, and a quotation from Tyrion. Now, I actually don't watch the show, just because of time! But I know there must be a ton of drinking given the time period of the show! Hi everyone! Today was a lazy Sunday for me as I'm still recovering from sickness. I actually left my apartment today for some groceries and got to see a ton of Marathoners who just completed the race! Awesome for them! Anyway, Born Pretty sent me 12 sets of water decals! I am showing off one of the four from the first set, so let's get to it! Remember that I mentioned I was starting to get sick? Well, I'm full blown sick now. But this box of polishes landed on my doorstep two days ago and I got myself to swatch just the one, and well, since it's only available until the 6th, I had to show you! I have another Polish Pickup exclusive for you today! And I'll have one more tomorrow! Each month, Polish Pickup seems to get bigger and bigger! Alter Ego picked Project Runway as her inspiration, with the signature "Make It Work" phrase! It was inspired by Tim Gunn's hair and his amazing fashion sense! It's November and I'm starting it off with a swatch from Stella Chroma's newest contribution to the November Polish Pickup, based on Fandoms! She's not only a huge Harry Potter fan but a huge Game of Thrones fan. Now, I don't watch the show, but I don't deny when a polish is pretty!